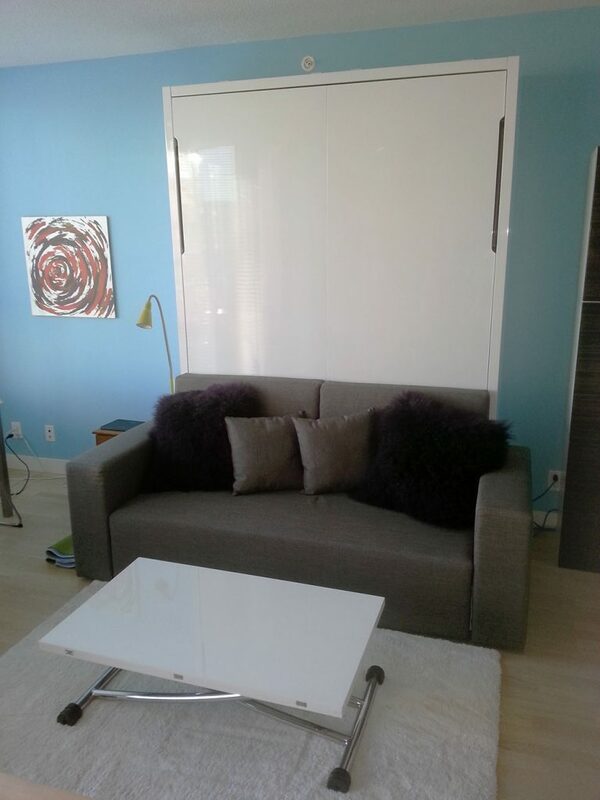 This Wall bed couch combination was installed in a Main Street apartment in Vancouver. Our customer choose to move his bedroom into the lounge and create an office in his former bedroom. Why did he do this? His bedroom did not get very much light and he needed a dedicated workspace. It was a simple solution that added an extra room to his apartment. This unit is the MurphySofa clean wall bed, which means the legs come from the side of the face panel with no visible floating shelf or handles. Because of the clean face panel and no obstructing handles this unit can fold over top of the white gloss coffee table as you can see in the photo. The grey love seat sofa stays in place when the white gloss wall bed folds over the unit. The sofa also has storage capacity built inside of the unit. The transforming table also acts as a kitchen table space saver for this Vancouver apartment. It simply raises up and folds open to double its size. It can rest at dining height and is easily movable on wheels.